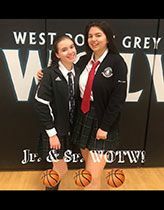 Rio Townsend ’19 of the varsity girls basketball team had an outstanding tournament at last weekend’s Wolves Invitational, leading the team in rebounding and scoring 29 points in their game against Princess Margaret. She was named MVP for the team for her efforts during the tournament and for her part in bringing home a silver medal. Miranda Butler ’21 is a team leader for the junior girls basketball team, both on and off the court. She is a great point-guard and takes charge by making sure our offence is set up. She also listens to coaching tips and successfully uses them in game situations. Miranda has contributed to and played games for both the junior and varsity teams, a testament to how valued she is to West Point Grey Athletics. Congratulations to these Wolves of the Week!